The Opportunity Agenda’s leadership brings deep roots in the social justice world as well as expertise on the communications techniques and law and policy frameworks necessary to create change. They use this experience and knowledge to create a nimbler, more effective social justice movement that can move hearts, minds, and policy on the most pressing issues. 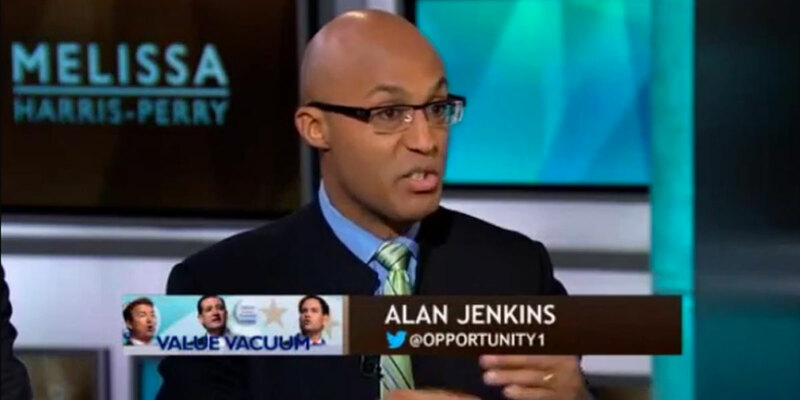 Alan Jenkins is one of the country’s leading thinkers on the relationship between media, public opinion, law, policy, and ensuring opportunity for all Americans. He has made change from the inside, as the Assistant to the Solicitor General at the U.S. Department of Justice, from the outside, as Associate Counsel to the NAACP Legal Defense and Educational Fund, and now movement-wide, as President and Co-Founder of The Opportunity Agenda, a communications, research, and policy organization dedicated to building the national will to expand opportunity in America. Ellen Buchman brings to The Opportunity Agenda a remarkable breadth of expertise, knowledge, experience, and relationships among leaders at the local, state, national and international levels. She comes to the organization from The Leadership Conference on Civil and Human Rights and The Leadership Conference Education Fund, the nation's oldest and largest civil and human rights coalition, where she has served as Executive Vice President for Field and Communications and in other key positions since 2003. Ellen started the organization's field and organizing program, and has a range of expertise from serving previously in state and national institutions and campaigns. Julie Fisher-Rowe has been building advocates’ capacity to offer a shared values-based narrative for more than two decades. She is a leading thinker on framing and messaging and helped drive the creation of a movement-wide coordinated communications strategy in support of immigrant rights and integration. Eva Marie Malone is an issue expert on economic opportunity and a strategy expert on the growth and development of high-capacity organizations that can effectively communicate a shared, forward-looking vision. She has extensive experience with nationally-known legal organizations and publications such as the Pro Bono Institute, New Jersey Lawyer, and American Immigration Lawyers Association. Betsy Richards is a key driver of the public conversation on the relationship between the arts and social justice, a leader on Native arts, and is supporting social justice leaders across the country in using storytelling and narrative shift strategies to make change. She has worked in the world of arts and culture from many angles, as a Program Officer in Media, Arts and Culture at the Ford Foundation, as the Director of Public Programs for the Pequot Museum, and in running multiple theater companies and directing on stages in New York, Los Angeles and Canada.